Technology has to keep breaking through the limits, make the imagination of future living becoming true. As technology becomes more and more mature, smart applications bring a wave of the smart city. In the past, IoT makes smart imagination come true by cloud computing; now, AIoT makes it perfectly by edge computing. Smart retail is representative of intelligent life for people, make a digitalization to brick and mortar store, bring up a whole new lifestyle. As the technology of edge computing becomes more and more mature, many of AIoT application start revealing their achievement. One of the successful cases is hosted and planned by the Industrial Technology Research Institute (ITRI). The stores in the mall can’t really have their own unique decoration with the limits of space; people can’t easily meet up at the purpose spot. So, internal navigation is essential to make a better intelligent life. Therefore, IRTI designed an algorithm that can guide in the building also set up a commercial platform for retailers to make more economic benefits. However, based on ITRI’s research, in the similar cases of positioning and navigation APP, which drive the algorithm with the cellphone, and soon found that cellphone is not efficient enough and cause decreasing of cellphone battery and too much storage of the phone is occupied. So ITRI choose for a powerful computing engine based on fog computing system that helps cellphone from computing workloads and also cooperate with the algorithm. Developer and system integrators build the system by Aetina Jetson platform as the parallel computation central, they deploy 24 Jetson platforms in the mall that can provide 5G fog computing wireless LAN for the customer to efficiently connect to 5G WiFi AP by their cellphone, in the meanwhile to accurately spot their position indoor. Jetson platform helps ITRI solves the problem about the overload memories and high consumption of battery to the cellphone. With the exclusive APP, most of the computing work will be taken by 5G fog computing, make a real-time detection and positioning. Moreover, the clients can use the cellphone camera to identify the store to get the information and promotion coupon. Aetina Jetson Platform is Small-Form-Factor, with high-quality edge computing performance and support Multiple Driver-Ready I/O Extension Module. In the retail industry, due to Jetson’s features, the retailer can easily deploy a smart platform that is flexible for their decoration, bring a better shopping environment for the clients. Jetson platform is suitable for both edge and fog computing, the main difference between edge and fog computing is distributed computing. Due to the enormous crowds in the shopping mall, several fog nodes are set up in the indoor space and required to compute the data as much as possible. That’s why Jetson platform plays an important role; every fog node can do the parallel-computing separately and share the result through WiFi or Internet. Smart application in the mall changes the interactive relations between the customers and public space; based on not letting cellphone to do too much computing work, the customers got benefits from having the map of the mall and store information easier. Also, the store owner can achieve the purpose of Online-to-Offline (O2O) by using this brand-new AR navigation and advertisement platform. 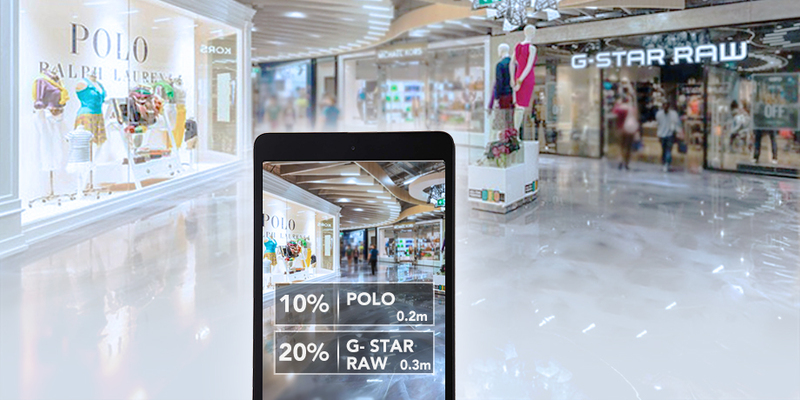 Aetina Jetson platform perfectly cooperates with IRTI’s developing abilities, push up the smart retail together, bring a win-win situation to the retailer and the customers. Successful connected O2O chain with a brand-new shopping style. Efficiently powered GPGPU parallel computing can offload the loading from a cellphone, brings a better and faster user experience. Small-form-factor of the system makes the decoration of store more flexible. Driver proofed I/O extend modules cut down the consumption of money and time.